Three men: an editor, a photographer, and a journalist are covering a political convention in Miami. They decide to walk up and down the beach during their lunch hour. Halfway up the beach, they stumbled upon a lamp. As they rub the lamp a genie appears and says "Normally I would grant you three wishes, but since there are three of you, I will grant you each one wish." The photographer went first. "I would like to spend the rest of my life living in a huge house in St.
Thomas with no money worries." 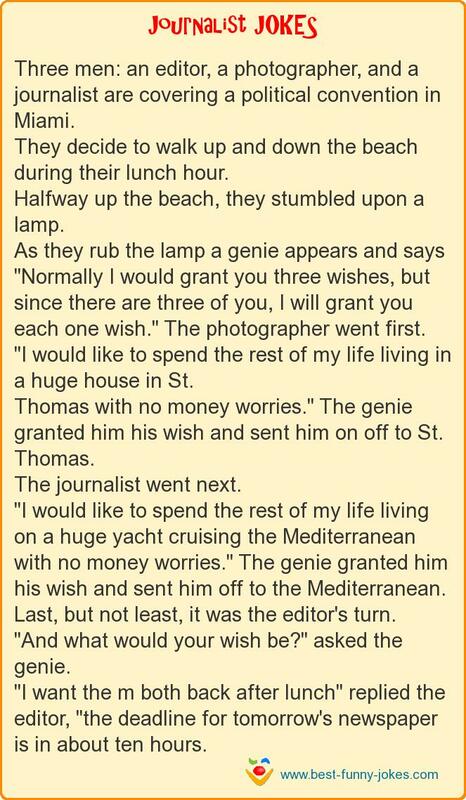 The genie granted him his wish and sent him on off to St.
"I would like to spend the rest of my life living on a huge yacht cruising the Mediterranean with no money worries." The genie granted him his wish and sent him off to the Mediterranean. Last, but not least, it was the editor's turn. "And what would your wish be?" asked the genie. "I want the m both back after lunch" replied the editor, "the deadline for tomorrow's newspaper is in about ten hours.